Greetings from Gatlinburg! I am enjoying what is known as a “zero day” in hiker terminology, meaning I am taking a day of rest from the rigors of hiking and using the time to tend to my equipment, recharge my electronics, and fill up on some town food. This is the first zero day my hiking group that I fell into has taken in the three weeks we have been out on the trail and, believe me, it is heavenly! I’ve alluded to this group of hikers in my previous post, and I thought I’d spend this entry describing the group of people I’ve gotten to know well over the past few weeks. 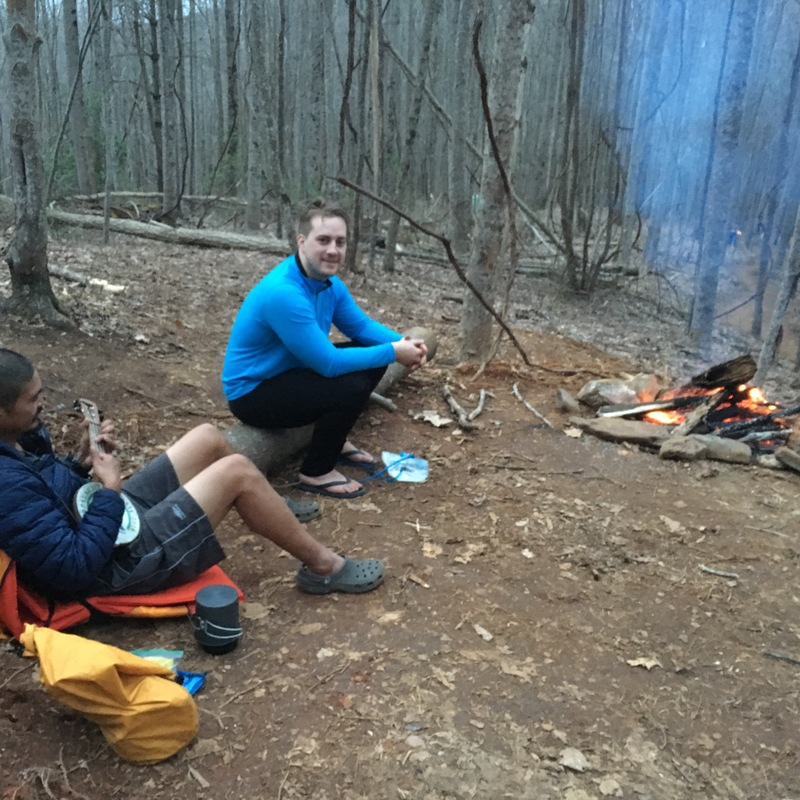 On my very first day, when I was trudging along the grueling approach trail from Amicalola Falls State Park, I ran across a couple of fellow hikers who were taking a brief break. One of the pair of hikers, “Juan Durer” (one of the most creative trail names I’ve encountered so far) had a great conversation starter in that he carried what appeared to be a small banjo on the back of his pack. Upon further questioning, I learned that this instrument was a “banjolele” – a combination of a banjo and ukulele. The other hiker was from the Baltimore area and had recently gotten out of the Marine Corps. (He would later take on the trail name of “Oriole” due to his loyalty to the baseball team.) 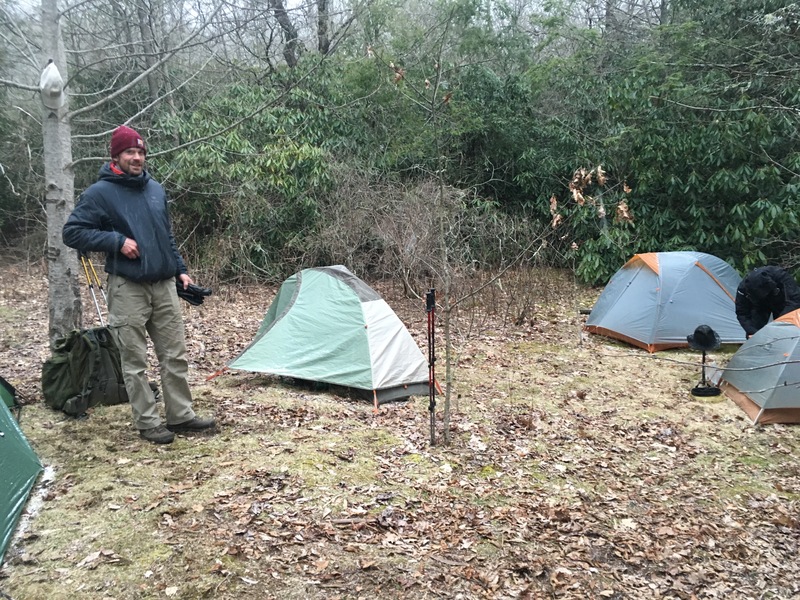 After exchanging names and pleasantries, I continued on by myself; but we would continue to see one another throughout the day, reaching the southern terminus of the AT, Springer Mountain, at the same time. We tented near each other that first night at the shelter near the summit, and have been hiking together ever since. Juan and Oriole enjoying the warmth of the campfire. We soon picked up another member a few days later. “Monster”, a 6’5’’ tall German with 12 years of military experience and a thick accent joined our small envoy on the third day of the journey. Monster earned his trail name, not because of his size or demeanor (he is a very humourous and amiable fellow), but instead because of the larger-than-life pack he carries. It weighed over 66 pounds when he started! Together, Juan, Oriole, Monster, and I have made up a pretty tight-knit hiking group. We rarely hike all together; instead, every night we review our guidebooks and discuss how far we plan on traveling the next day, and then we hike at our own pace, and reconvene at the appointed campsite the following evening. It is a system that has worked beautifully thus far, and the camaraderie we share has truly enhanced my trail experience. We have met and traveled with many others along the way. One hiker, aptly named “Miles” as he had covered over 40 miles in just his first two days on the trail, had been part of our little pack for about a week. We ran into him a few days into the hike, and he meshed well with our group. Miles had a history of participating in ultramarathons prior to starting the AT, thus he was primed and conditioned for big mileage days. Poor Miles stuck with us for a long time, but ultimately his yearning for covering more distance quickly won out, and he is now most likely well ahead of us. While we miss Miles’ company, we understand that this is part of the nature of the hiking community. Much like life itself, it is a series of meetings and partings. Often you run into the same people repeatedly over the course of a week, sometimes – like our group – you try to stick together over the long haul, but you never truly know when the last time you may be in the company of another hiker. Even with our group, we are well aware that there will likely come a time when we go our separate ways; thus, we try to make the most of our time together. And so, for the rest of this day, we shall enjoy our time in the tourist mecca of Gatlinburg, before we head back out to the trail tomorrow with recharged batteries and full bellies, to take on the last stretch of the Great Smoky Mountains National Park – a truly beautiful place if you have never been.